Package details: Melsmon 50 vials X 2 ml each. 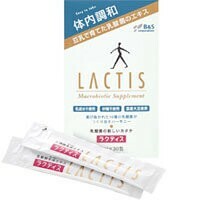 Active ingredient: human placenta hydrolysate, sodium hydroxide - to pH 7.0, water d / and less than 2 ml. Start of sales: in Japan after clinical trials (conducted throughout the country in 98 cases) in 1959, March. Side effects and contraindictaions: follow prescribed dosage. Keep out of reach of children in cool dru place. Allergy reactions possible. As a result of clinical studies, four large groups of medical effects of Melsmon were recognized. an improvement in blood clotting. Clinical trials of Melsmon revealed the main side effects of the drug. The researches have noticed rash and redness in 0.5-5% of cases. But a direct connection to the components of the medicine wasn't found. Allergic reactions also were not observed during the trials. But still, they are possible. And since anaphylactic shock may take place, the injections should be used with caution. 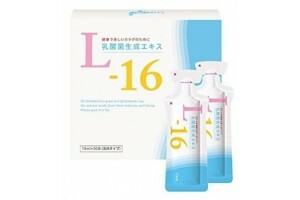 In addition, there are contraindications for use during pregnancy and breastfeeding. 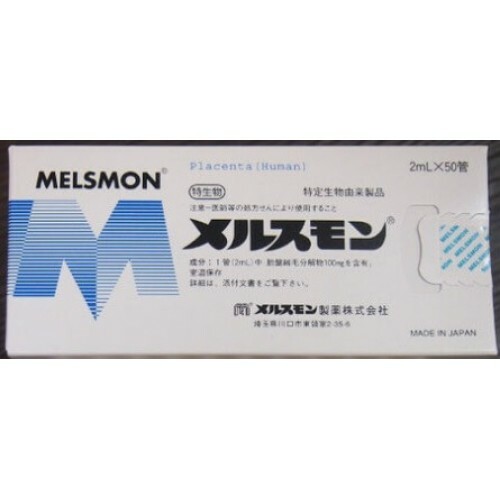 Clinical trials of melsmon injection took place from the 1950s to the 1990s mainly in Japan. Karasawa Yosuke (唐沢陽介), the leading medical researcher in Japan, in several of his articles focused on Melsmon and its effects. His works are published in the Pharmacology and Treatment journal (薬理と治療9（3）299～308、81) and also in "The Basics and the Clinical Trials" (：基礎​​と臨床15（3）661～670、1981). Truth about Melsmon: "Miracle" elixir or Dummy? 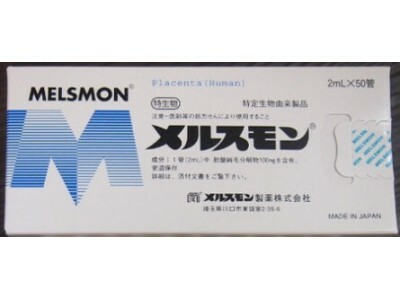 Melsmon is a placental injection, very popular in Japan and in Asia. You can get genuine Japanese Melsmon in a number of countries where it is licensed. 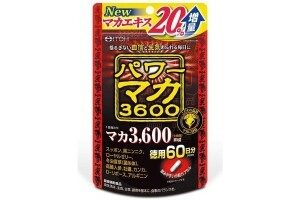 However, the information about this product can be misleading. Melsmon is widely perceived as a panacea. It is said to be able to treat oncology, diabetes, with a variety of other fatal diseases. This has no proved medical background! And it's very strange, since distributors in no country claim such fantastic effects of Melsmon. So, let's try to figure out what the Japanese Melsmon is really effective for and how it can be used in best way. Melsmon is very popular in Japan and Asia precisely because it helps to achieve the whitening effect of the skin in a very short time. In Asian countries, white skin has long been valued as a standard of beauty. Therefore, Melsmon has gained such popularity in this region. 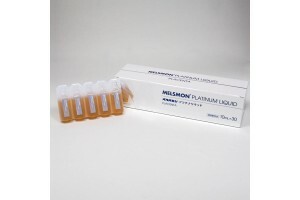 Melsmon creates a particularly pronounced whitening effect of the skin, removes senile and dyshormonal pigment spots. This effect is achieved due to the marked recovery of epidermal cells. 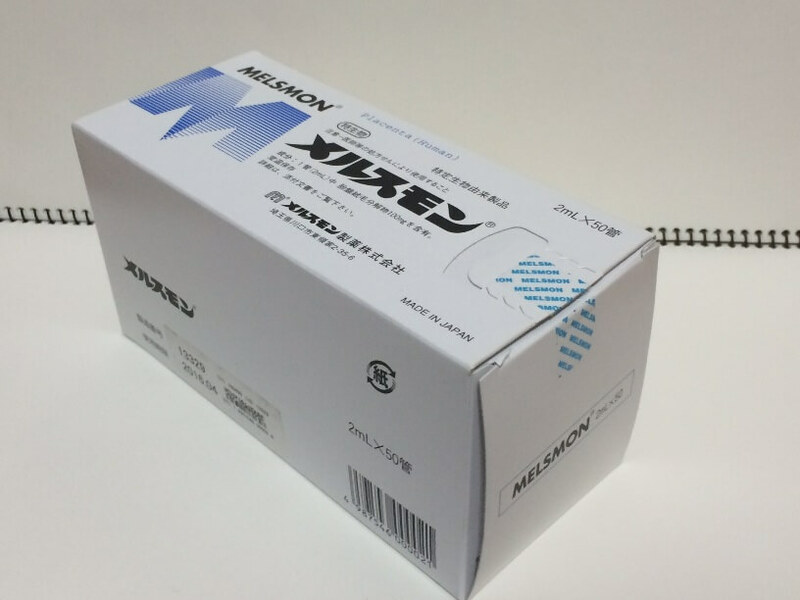 Thus, Melsmon from Japan allows to achieve a stable and long-lasting whitening effect of the skin due to the regulation of cellular metabolism. Treatment for menopause is a proven medical function of the Japanese Melsmon. A comparative clinical test was held in Japan in 1980. As a result, 77.4% of women receiving Melsmon injections confirmed it was very effetive to both psychological and physical symtoms. While the control group receiving placebo couldn't boast with great results. Melsmon eliminates mood swings and normalizes blood pressure. Also, it eliminates headaches because headaches are often the consequence of blood pressure fluctuations. Melsmon is effectively used for the prevention of menopause, as treatment of early menopause symptoms, and for the treatment of severe symptoms of menopause. 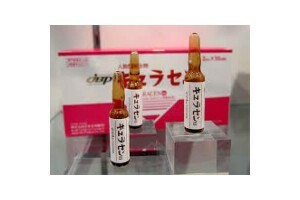 But depending on the symptoms, the dosage and frequency of application of Melsmon from Japan are different. 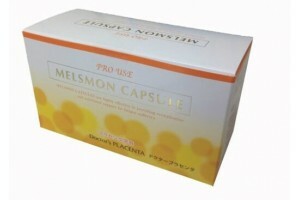 Melsmon from Japan is very effective for restoring strength and fighting everyday stress. It also normalizes the phases of sleep, giving the body an additional opportunity to recover and regenerate more efficiently. For scientifical explanation, please refer to the following study held on over 300 patients. Kang-Kon Lee, Whan-Seok Choi et.al. Efficacy and Safety of Human Placental Extract Solution on Fatigue: A Double-Blind, Randomized, Placebo-Controlled Study. Evidence-Based Complementary and Alternative Medicine, 2012; 2012: 130875. (accessible here). Due to these effects of Melsmon, greater clarity of mind is achieved and work efficiency increases. You have more strength and time to live and create, to go further and live the life you want. Melsmon invigorates the body and spirit, enhances sexual desire and increases the body's immunity. 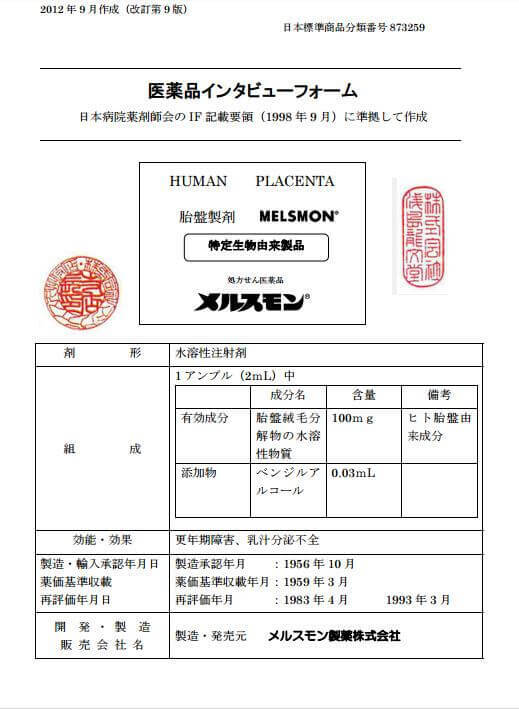 Japanese Melsmon, like a number of other placental preparations, can be undeservedly accused of being "unethical". You could hear rumors that it's carrying the infection or provoking oncology. All these acusations have no single medically proven basis or confirmed case. First, Melsmon restrains the growth of cancer cells, replacing old cells with new cells. That's why it's suppressing dangerous mutations that lead to cancer. For example, there are studies about treating ovarian cancer with human placenta tissues. (Lan Zheng, Dongmei Zhang et. al. Antitumor Activities of Human Placenta-Derived Mesenchymal Stem Cells Expressing Endostatin on Ovarian Cancer. PLOS One. 2012; 7(7): e39119. Accessible here). Melsmon physically cannot provoke the oncology or cancer in any possible way. Second, before going to the pharmacy, Melsmon’s commodity passes several cycles of molecular purification. So there is no possibility of getting infected at all. Moreover, the use of this drug is ethical. 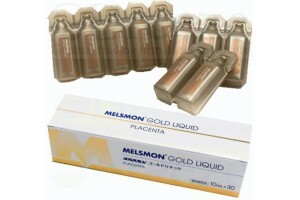 Because the placenta used for Melsmon production is obtained only from healthy women with a successful birth. And other, supposedly safer methods of rejuvenation, such as peeling and polishing, actually accelerate the aging process. These methods may be damaging cells, rather than rejuvenating the cells, as does Melsmon. Japanese experts recommend starting to apply Melsmon after 25 years old. Because, regrettably, at this time the content of collagen and elastin in the skin starts to reduce. 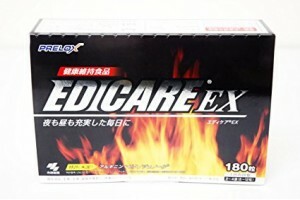 Accelerates skin regenerations after injuries. Melsmon has significant visible whitening and firming effects on the skin. 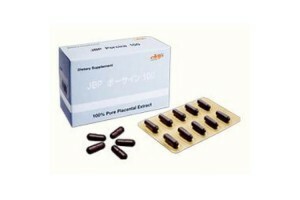 During menopause headaches due to high blood pressure became unbearable. I became moody and irritable, nothing pleased me. Insomnia and depression have become my best friends. The doctor advised to undergo treatment placental with Melsmon. I was skeptical about this recommendation, but agreed. Simply because there was nothing to lose for me. Soon I felt significant relief: blood pressure normalized, mood swings stopped. When I passed clinical tests, I discovered that in just two months the level of estrogen in my blood rose, and cholesterol decreased greatly! By the way, all my friends say that I look really prettier! I have always suffered from excess weight, but it did not bother me before I got serious health problems. Finally, I pulled myself together, and for two years decreased my weight using diets from 115 to 81 kg. I was glad to lose weight, but not quite happy about my skin grown old, wrinkles and dark circles around eyes. My doctor advised me to undergo Melsmon medical course in clinic. I agreed and made special treatment for my face, and the results were incredible! Like in that movie with Bruce Willis, where his wife, Meryl Streep, drinks a Potion. My skin became more fresh and young, Melsmon smoothed wrinkles. I also feel myself in great mood now! I am very pleased with the results! I was having regular treatment with Melsmon . For me, the treatment brings visible effects. Though I do not often repeat procedures, effect remains for a long time. I only do it two or three times a year, but for several years already. Very pleased with the effect of this medicine. Actually I did lifting, but after that course my doctor advised me also to apply Melsmon . 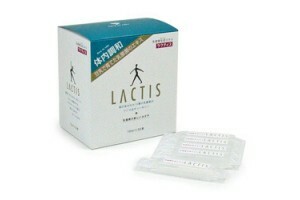 She said it is a novelty, a Japanese medicine from placenta that delivers impressive results. Due to medical lifting, my skin tightened , and melsmon helped to remove pigmentation from the skin and it now really shines! I am very grateful to the doctor for this advice. All my friend are now asking me how I managed to get such impressive results. Treatment of early menopause: 3 months. 2 vials x 1 time per week 6 months. 1 vial x 1 time per week. Treatment of severe symptoms of menopause: 2 -3 weeks 1 vial every other day. 3 months. 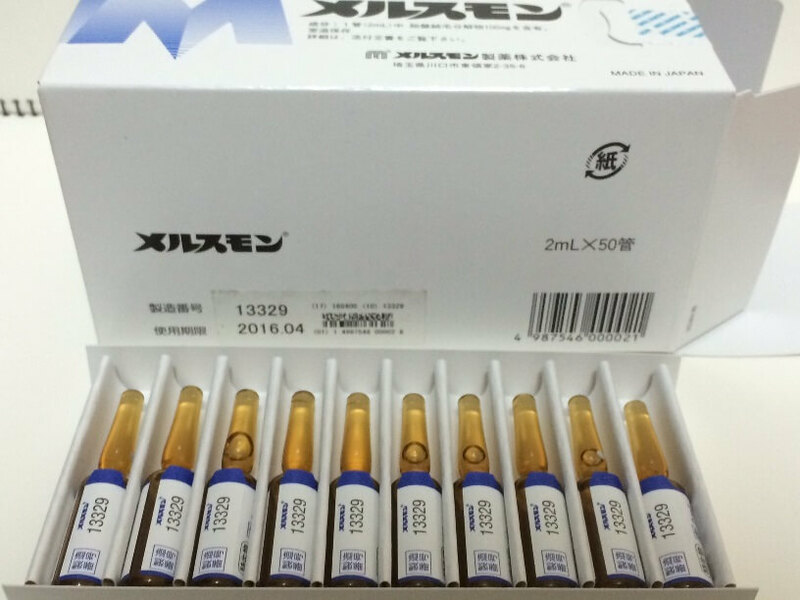 2 x 2 vials per week 1 -12 months. 1 vial x 1 time per week to secure the effect. 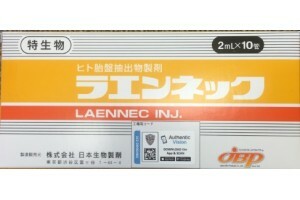 Recommended Dosage: One ampoules/injection every 2-3 days for 1-2 months. 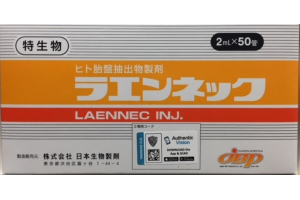 This product is administered via subcutaneous inj. 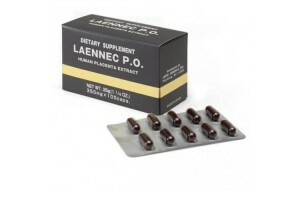 Breast feeding period Menstrual Period Patient with cardiovascular problem The effect of placenta extracts is highly relies on the individual's age and health condition. Effects can be seed as fast as one week in some patiends and may take as much as 60 days in others. 1. "What if I will have side effects, including oncological diseases?". Regeneration of cells is stimulated only up to a "normal" level. Besides, there is a medical factor in the composition of Melsmon that inhibits the growth of tumor cells, so it is impossible. 2. "What if I get some kind of infection? I know that placenta is a biological material?" 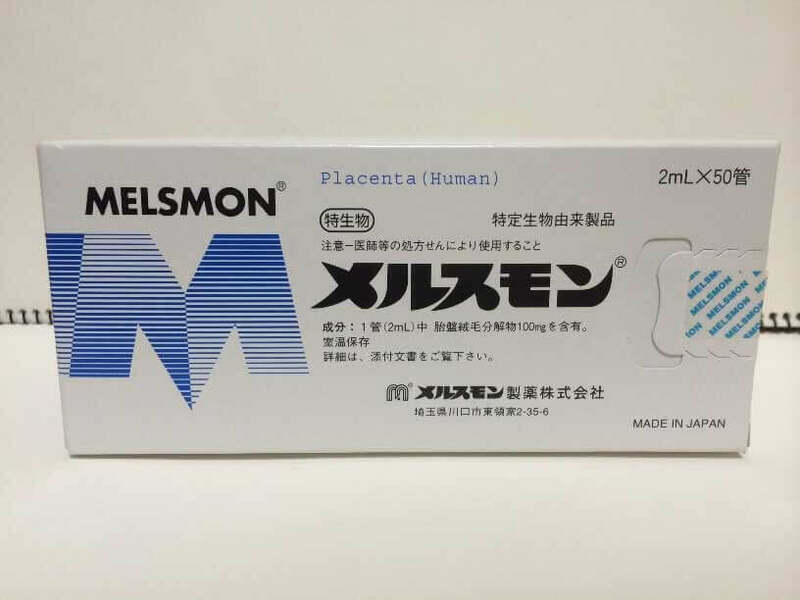 In the manufacturing process of Melsmon raw material passes the placenta molecular purification cycle. No pathogens shall ever be found in this medicine. 3. "Placenta therapy is unethical treatment!”. Raw material goes through careful selection and separation. Only placenta that was received as a result of safe childbirth by healthy women is used for drug! No placenta got as a result of abortion is ever used for Melsmon production. 4. "Let 50 year old women care about Anti-Aging!" Aging begins at the age of 25, when decreasing amount of collagen and elastin start to affect elasticity and strength of skin, and its moisture level. Melsmon application can help delay aging symptoms. 5. "There are safer ways for anti-aging. For example, peeling or dermabrasion effect!". These methods, if applied often, on the contrary, shall lead your skin to aging. Certainly, our customers have many doubts about Melsmon. What clinical trials of melsmon were conducted? Is melsmon effective or not? 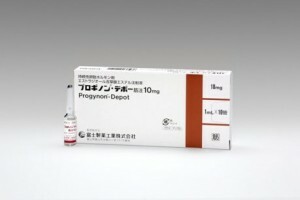 What is the difference between melsmon and other placenta injection medicines from Japan? If you'd like to know answers to these questions, you can find them in the articles in our blog. Please check links below. 1. Special seal and "Made in Japan" inscription. Date of manufacture, serial number and 3D bar code. 2. 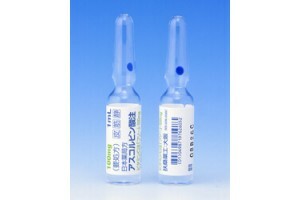 Each ampoule of Melsmon has serial number. Blue and white ampoules only! 3. Made in Japan inscription in bottom right. Original Melsmon seal. BE SURE YOU ORDER ORIGINAL MELSMON FROM JAPAN! 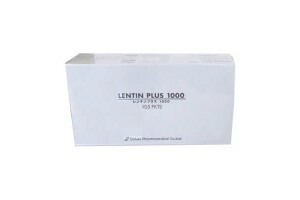 PAY BY BANK FOR 50 VIALS AND GEYT 100 USD DISCOUNT ! CONTACT US NOW! PAY BY BANK, ORDER 3 BOXES AND GET 450 USD DISCOUNT, 150 USD OFF PER 1 BOX! Thanks for fast delivery to UK. Package is safe and no vials broken. Melsmon is great for skin whitening, that's why I love it so much. Hello, Is it good for liver function? Thank you, this is my 3rd order, everything is great as usual. Thank for lnc cosmetics sample, i shall check it out. Thank you for fast shipping and real Japanese quality. I shall order 10 more vials next month. Buy melsmon to Malaysia in bulk. Good supplier and original product. Thank you. Order to Australia several times a year. Thanks for your service and disocunts. Fast delivery and genuine injections. Thanks for great service. Goods arrived today, everything is fine, thank you. Maybe some discount next time? Goods received. Took a bit longer then last time. Thanks for face mask sample!